For those who don’t know, let me bring you up to speed. 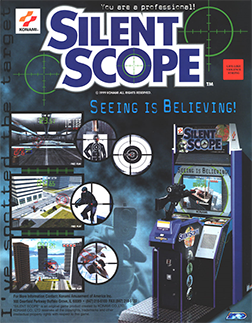 Silent Scope began life on the Arcades back in 1999. It was basically another light-gun game in the same vein as The House of the Dead and Time Crisis. But what made it stand out was that this was a sniping game. In the picture to the left, you can see that the cabinet had a sniper rifle attached. On the main screen, you’re presented a faraway shot with reticles highlighting your targets, to which you would line up for rifle with these reticles. Once in place (or close to), you then looked into the eyepiece, which had another screen inside the showing you a closeup shot and a clear view of your target. And then of course you shot the target. This video demonstrates how it’s done. So with a novel idea like this, it was bound to come to consoles. And it did, but with one glaring omission: No sniper rifle peripheral. Then again, light gun games didn’t sell well anyway due to the need to have a light gun in the first place, which would be costly (and we’re talking about a gun with another screen inside). But the idea was still a good one for Silent Scope. In the home port, you still have a faraway shot with reticles. Looking through the scope was done with a viewfinder overlay. The execution was… okay. But it still didn’t compare to having the rifle in the arcade version. There was simply no market for this kind of arcade experience on home consoles, nor would it be feasible. But now there is. 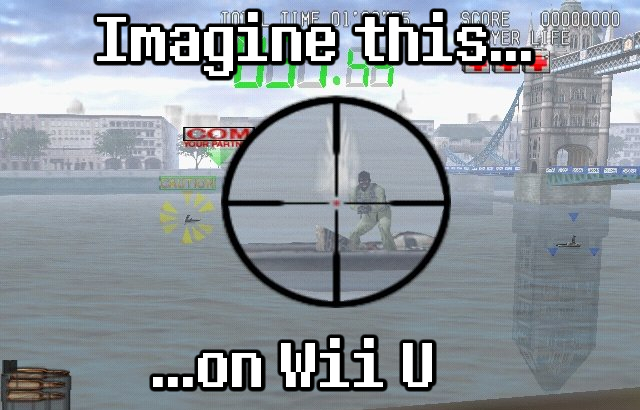 The Wii U tablet can very much be that rifle. What made the original Silent Scope rifle cool was that it had another screen in the scope. 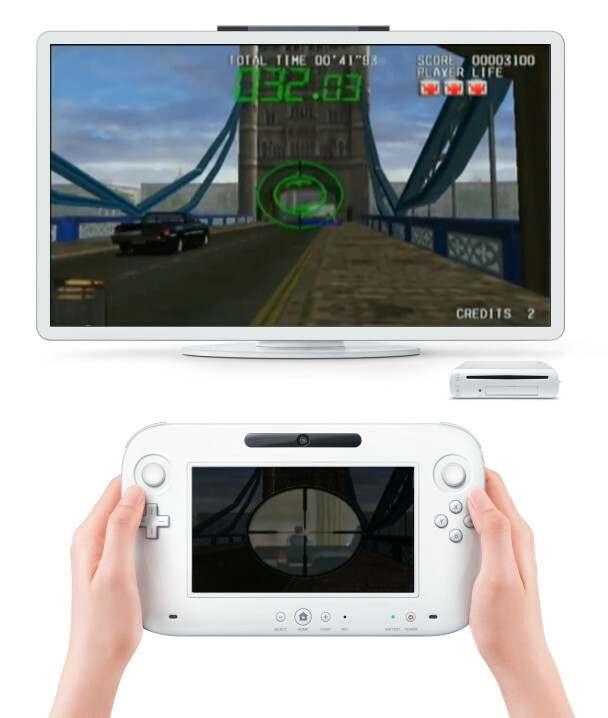 Now that second screen will be the standard for the Wii U’s Gamepad. Plus, with the motion sensor in the Gamepad, you can move the pad around to move the scope, much like you did with the rifle in the original arcade. Or for those that don’t want to move the pad around, still have the option to use buttons to move your reticle on a target and still see through the scope on the Gamepad. So whaddaya say Konami, ready to bring back Silent Scope?